"Balder" redirects here. For other uses, see Balder (disambiguation). Baldr (also Balder, Baldur) is a god in Norse mythology, and a son of the god Odin and the goddess Frigg. He has numerous brothers, such as Thor and Váli. In the 12th century, Danish accounts by Saxo Grammaticus and other Danish Latin chroniclers recorded a euhemerized account of his story. Compiled in Iceland in the 13th century, but based on much older Old Norse poetry, the Poetic Edda and the Prose Edda contain numerous references to the death of Baldr as both a great tragedy to the Æsir and a harbinger of Ragnarök. According to Gylfaginning, a book of Snorri Sturluson's Prose Edda, Baldr's wife is Nanna and their son is Forseti. In Gylfaginning, Snorri relates that Baldr had the greatest ship ever built, Hringhorni, and that there is no place more beautiful than his hall, Breidablik. Jacob Grimm in his Teutonic Mythology (ch. 11) identifies Old Norse Baldr with the Old High German Baldere (2nd Merseburg Charm, Thuringia), Palter (theonym, Bavaria), Paltar (personal name) and with Old English bealdor, baldor "lord, prince, king" (used always with a genitive plural, as in gumena baldor "lord of men", wigena baldor "lord of warriors", et cetera). Old Norse shows this usage of the word as an honorific in a few cases, as in baldur î brynju (Sæm. 272b) and herbaldr (Sæm. 218b), both epithets of heroes in general. Grimm traces the etymology of the name to *balþaz, whence Gothic balþs, Old English bald, Old High German pald, all meaning "bold, brave". But the interpretation of Baldr as "the brave god" may be secondary. Baltic (cf. Lithuanian baltas, Latvian balts) has a word meaning "the white, the good", and Grimm speculates that the name may originate as a Baltic loan into Proto-Germanic. In continental Saxon and Anglo-Saxon tradition, the son of Woden is called not Bealdor but Baldag (Saxon) and Bældæg, Beldeg (Anglo-Saxon), which shows association with "day", possibly with Day personified as a deity. This, as Grimm points out, would agree with the meaning "shining one, white one, a god" derived from the meaning of Baltic baltas, further adducing Slavic Belobog and German Berhta. Grimm's etymology is endorsed by modern research. According to Rudolf Simek, the original name for Baldr must be understood as 'shining day'. One of the two Merseburg Incantations names Baldere, but also mentions a figure named Phol, considered to be a byname for Baldr (as in Scandinavian Falr, Fjalarr; (in Saxo) Balderus : Fjallerus). In the Poetic Edda the tale of Baldr's death is referred to rather than recounted at length. Among the visions which the Völva sees and describes in the prophecy known as the Völuspá is one of the fatal mistletoe, the birth of Váli and the weeping of Frigg (stanzas 31–33). Yet looking far into the future the Völva sees a brighter vision of a new world, when both Höðr and Baldr will come back (stanza 62). The Eddic poem Baldr's Dreams mentions that Baldr has bad dreams which the gods then discuss. Odin rides to Hel and awakens a seeress, who tells him Höðr will kill Baldr but Vali will avenge him (stanzas 9, 11). Apart from this description, Baldr is known primarily for the story of his death. His death is seen as the first in the chain of events which will ultimately lead to the destruction of the gods at Ragnarök. Baldr will be reborn in the new world, according to Völuspá. He had a dream of his own death and his mother had the same dreams. Since dreams were usually prophetic, this depressed him, so his mother Frigg made every object on earth vow never to hurt Baldr. All objects made this vow except mistletoe—a detail which has traditionally been explained with the idea that it was too unimportant and nonthreatening to bother asking it to make the vow, but which Merrill Kaplan has instead argued echoes the fact that young people were not eligible to swear legal oaths, which could make them a threat later in life. When Loki, the mischief-maker, heard of this, he made a magical spear from this plant (in some later versions, an arrow). He hurried to the place where the gods were indulging in their new pastime of hurling objects at Baldr, which would bounce off without harming him. Loki gave the spear to Baldr's brother, the blind god Höðr, who then inadvertently killed his brother with it (other versions suggest that Loki guided the arrow himself). For this act, Odin and the giantess Rindr gave birth to Váli who grew to adulthood within a day and slew Höðr. Baldr was ceremonially burnt upon his ship, Hringhorni, the largest of all ships. As he was carried to the ship, Odin whispered in his ear. This was to be a key riddle asked by Odin (in disguise) of the giant Vafthrudnir (and which was unanswerable) in the poem Vafthrudnismal. The riddle also appears in the riddles of Gestumblindi in Hervarar saga. The dwarf Litr was kicked by Thor into the funeral fire and burnt alive. Nanna, Baldr's wife, also threw herself on the funeral fire to await Ragnarök when she would be reunited with her husband (alternatively, she died of grief). Baldr's horse with all its trappings was also burned on the pyre. The ship was set to sea by Hyrrokin, a giantess, who came riding on a wolf and gave the ship such a push that fire flashed from the rollers and all the earth shook. Upon Frigg's entreaties, delivered through the messenger Hermod, Hel promised to release Baldr from the underworld if all objects alive and dead would weep for him. All did, except a giantess, Þökk (often presumed to be the god Loki in disguise), who refused to mourn the slain god. Thus Baldr had to remain in the underworld, not to emerge until after Ragnarök, when he and his brother Höðr would be reconciled and rule the new earth together with Thor's sons. Writing during the end of the 12th century, the Danish historian Saxo Grammaticus tells the story of Baldr (recorded as Balderus) in a form that professes to be historical. According to him, Balderus and Høtherus were rival suitors for the hand of Nanna, daughter of Gewar, King of Norway. Balderus was a demigod and common steel could not wound his sacred body. The two rivals encountered each other in a terrific battle. Though Odin and Thor and the other gods fought for Balderus, he was defeated and fled away, and Høtherus married the princess. Nevertheless, Balderus took heart of grace and again met Høtherus in a stricken field. But he fared even worse than before. Høtherus dealt him a deadly wound with a magic sword, named Mistletoe, which he had received from Mimir, the satyr of the woods; after lingering three days in pain Balderus died of his injury and was buried with royal honours in a barrow. There are also two lesser known Danish Latin chronicles, the Chronicon Lethrense and the Annales Lundenses of which the latter is included in the former. 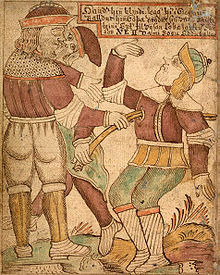 These two sources provide a second euhemerized account of Höðr's slaying of Baldr. It relates that Hother was the king of the Saxons and son of Hothbrodd and Hadding. Hother first slew Othen's (i.e. Odin) son Balder in battle and then chased Othen and Thor. Finally, Othen's son Both killed Hother. Hother, Balder, Othen and Thor were incorrectly considered to be gods. A Latin votive inscription from Utrecht, from the 3rd or 4th century C.E., has been theorized as containing the dative form Baldruo, pointing to a Latin nominative singular *Baldruus, which some have identified with the Norse/Germanic god, although both the reading and this interpretation have been questioned. As referenced in Gylfaginning, in Sweden and Norway, the scentless mayweed (Matricaria perforata) and the similar sea mayweed (Matricaria maritima) are both called baldursbrá "Balder's brow" and regionally in northern England (baldeyebrow). In Iceland only the former is found. In Germany lily-of-the-valley is known as weisser Baldrian; variations using or influenced by reflexes of Phol include Faltrian (upper Austria), Villumfallum (Salzburg), and Fildron or Faldron (Tyrol). There are a few old place names in Scandinavia that contain the name Baldr. The most certain and notable one is the (former) parish name Balleshol in Hedmark county, Norway: "a Balldrshole" 1356 (where the last element is hóll m "mound; small hill"). Others may be (in Norse forms) Baldrsberg in Vestfold county, Baldrsheimr in Hordaland county Baldrsnes in Sør-Trøndelag county—and (very uncertain) the Balsfjorden fjord and Balsfjord municipality in Troms county. In Copenhagen, there is also a Baldersgade, or "Balder's Street". A street in downtown Reykjavík is called Baldursgata (Baldur's Street). In Sweden there is a Baldersgatan (Balder's Street) in Stockholm. There is also Baldersnäs (Balder's isthmus), Baldersvik (Balder's bay), Balders udde (Balder's headland) and Baldersberg (Balder's mountain) at various places. In Belgium, the name Balder is also used in dialect for a village called Berlaar and in another village (Tielen), the Balderij is a street and a swampy area next to it. In Yorkshire there are Baldersby and Pule Hill (from Phol). In Nottinghamshire there is a village called Balderton, originally a vineyard. This is also mentioned in the Doomsday book. Baldur, Manitoba is a village in southern Manitoba, Canada. About 1890, Sigurdur Christopherson could not find a suitable flower in the district to name the town after, so he suggested the name of a beautiful Nordic God, namely Baldur, son of Odin. Earlier reflexes of Phol, especially in Baldr's role as opener of wells, appear as Pholesbrunnen (Thuringia), Phulsborn (village, near Saale river), Falsbrunn (Steigerwald, Franconia), and the village Pfalsau (OHG pholesauwa, pholesouwa). Also, there are two Baldersbrunno (Eifel mountains; Rhine Palatinate) and a Baldur's Brönd on the road between Copenhagen and Roeskilde (Saxo Grammaticus). ^ "Baldrs would in strictness appear to have no connexion with the Goth. balþs (bold, audax), nor Paltar with the OHG. pald, nor Baldr with the ON. ballr 'dangerous, dire'. As a rule, the Gothic ld is represented by ON. ld and OHG. lt: the Gothic lþ by ON. ll and OHG. ld. But the OS. and AS. have ld in both cases, and even in Gothic, ON. and OHG. a root will sometimes appear in both forms in the same language; so that a close connexion between balþs and Baldrs, pald and Paltar, is possible after all." ^ "Bæl-dæg itself is white-god, light-god, he that shines as sky and light and day, the kindly Bièlbôgh, Bèlbôgh of the Slav system. It is in perfect accord with this explanation of Bæl-dæg, that the Anglo-Saxon tale of ancestry assigns to him a son Brond, of whom the Edda is silent, brond, brand, ON. brandr (fire brand or blade of a sword), signifying jubar, fax, titio. Bældæg therefore, as regards his name, would agree with Berhta, the bright goddess. ^ Simek. Dictionary of Northern Mythology, 2007, 26. ^ "GYLFAGINNING [U]: 17-21". hi.is. Archived from the original on 2009-06-19. Retrieved 2007-11-11. ^ Colum, Padraic (1920). The Children of Odin. Aladdin Paperbacks. ISBN 0-689-86885-5. ^ Merrill Kaplan, 'Once More on the Mistletoe', in News from Other Worlds/Tíðendi ór ǫðrum heimum: Studies in Nordic Folklore, Mythology and Culture in Honor of John F. Lindow, ed. by Merrill Kaplan and Timothy R. Tangherlini, Wildcat Canyon Advanced Seminars Occasional Monographs, 1 (Berkeley, CA: North Pinehurst Press, 2012), pp. 36-60; ISBN 0578101742. ^ "Gylfaginning, XLIX". Archived from the original on 2007-09-30. Retrieved 2007-09-23. 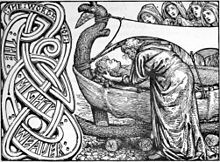 ^ According to Carolyne Larrington in her translation of the Poetic Edda it is assumed that what Odin whispered in Baldr's ear was a promise of resurrection. ^ Gutenbrunner, Siegfried (1936). Die germanischen Götternamen der antiken Inschriften. Max Niemeyer Verlag. , p. 210 & pp. 218-20. ^ North, Richard (1997). Heathen Gods in Old English Literature. Cambridge University Press. ISBN 0-521-55183-8. , p. 126. ^ Vermeyden, Pamela & Quak, Arend (2000). Van Ægir tot Ymir: personages en thema's uit de Germaanse en Noordse mythologie. Cambridge University Press. ISBN 90-6168-661-X. , p. 43. ^ Helm, Karl (1976). Balder, in Reallexikon der Germanischen Altertumskunde. Walter de Gruyter GmbH & Co KG. , p. 2. ^ a b Anna-Lena Anderberg. "Den virtuella floran: Tripleurospermum perforatum (Mérat) Laínz - Baldersbrå". nrm.se. ^ Legends of the Northmen, n.4: <>. ^ William P. Reaves, "Frigg, Baldur's Mother", Odin's Wife: Mother Earth in Germanic Mythology, at Germanicmythology.com, [pdf], 2010, p.4. 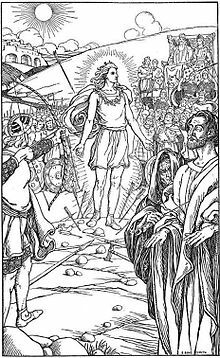 Wikimedia Commons has media related to Baldr. Wikisource has the text of the 1911 Encyclopædia Britannica article Balder. Jacob Grimm, Deutsche Mythologie (1835), chapter 11 "Paltar". MyNDIR (My Norse Digital Image Repository) Illustrations of Baldr from manuscripts and early print books. Clicking on the thumbnail will give you the full image and information concerning it. This page was last edited on 9 April 2019, at 21:30 (UTC).